GALION — Windfall Emanuel United Church of Christ, 1781 Biddle Road will have Easter services, starting with an Easter Sunrise choir program at 8 a.m., followed by breakfast prepared by the men of the church. The Easter morning worship service is at 10:30 a.m., which will be followed by a carry-in dinner. 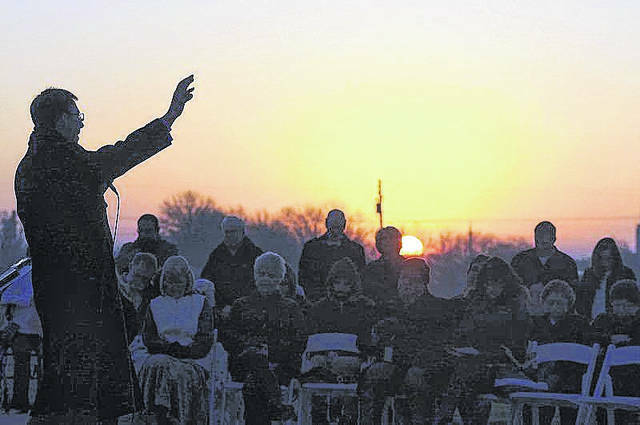 BUCYRUS — A community-wide Easter Sunday sunrise service is planned at 7 a.m. Sunday, April 1 in the grandstands at the Crawford County Fairgrounds. This non-denominational service, sponsored by the Bucyrus Ministerial Fellowship, features a dramatic recitation of the Easter Story by Matt Eichhorn and music by the Pastors Choir, made up of pastors from Bucyrus-area churches. With the grandstands facing east, this should offer a perfect view of the sunrise, weather permitting. Come early to reflect on the meaning of Christ’s resurrection as you witness the sunrise and enjoy prelude music starting at 6:45 a.m. The service will take place rain or shine. For information, call Bucyrus United Methodist Church at 419-562-5061 or First Alliance Church at 419-562-2069. MANSFIELD — Kingwood Center Gardens is excited to announce the opening of the 2018 season on April 1, with the annual Sunrise Easter Service at 7 a.m.
BUCYRUS — Josh Harris, president and CEO of Freedom Direct LLC, a final expense life insurance call centers, will be the guest speaker for the next interdenominational men’s breakfast at 7 a.m. on April 11 in the cafeteria at Bucyrus Community Hospital. He also was a quarterback for Bowling Green State University. Ladies are welcome to attend. Woodlawn United Methodist Church in Bucyrus sponsors this event. Visit http://bucyruswumc.com/ for information.